Wednesdays, I explore the linguistic origins of one word in different languages. I recently saw Disney’s SLEEPING BEAUTY for the first time and was significantly blown away by how beautiful it is. The background images are very stylized and I love them. I wish I had wallpaper of some of the forest scenes so that I could sleep surrounded by weird ferns and gnarled trees. Besides being stunning to look at, the story is well told and not at all annoying (unlike Disney’s SNOW WHITE which I can’t get through because Snow’s voice makes me want to tear my ears off). Also fun: finding a Word Mystery in the looking glass! EN → mirror — a reflective surface, now typically of glass coated with a metal amalgam, that reflects a clear image. ORIGIN from Old French mirour, based on Latin mirare [look at]. 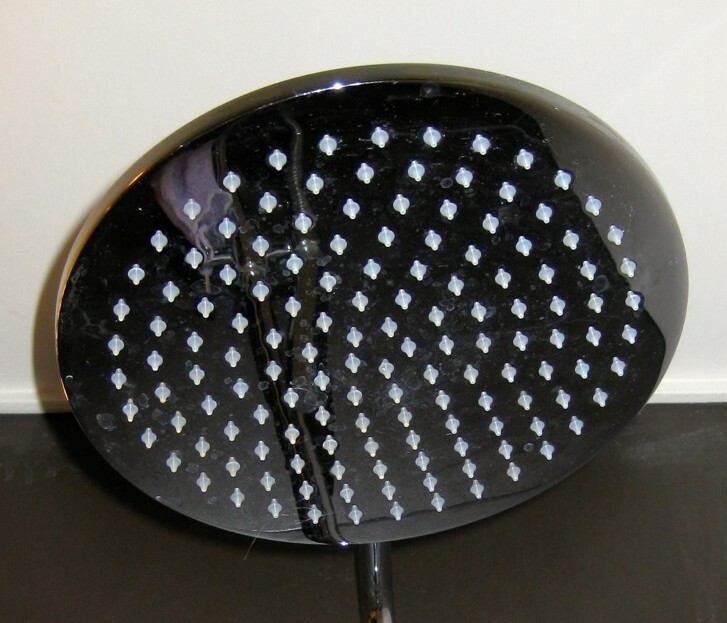 ES → espejo — Tabla de cristal azogado por la parte posterior, y también de acero u otro material bruñido, para que se reflejen en él los objetos que tenga delante. [Glass piece which is silvered on the back (also steel or other brushed metal) so that objects placed in front of it are reflected.] ORIGIN Latin specŭlum. GR → Spiegel — Gegenstand aus Glas oder Metall, dessen glänzende, glatte Fläche Bilder, optische Erscheinungen zurückwirft. [An article of glass or metal which reflects back the shiny, smooth surface of photo optical phenomena.] ORIGIN Latin specŭlum. Spanish note: this is one of the most oddly worded definitions I’ve come across. I usually waver between semi-literal translations and ones that read better, but this one kind of stumped me. Even in Spanish I think it reads badly. Loses just because it offended me on an aesthetic level. German note: I’m more than a little disappointed that this shares the exact same root as Spanish. I wonder how many Latin words root German ones? Will have to look into this. German note Zwei: I don’t speak German. I only know this word because it’s printed on the side of my mirror. Today’s winner is English since I love the Latin meaning. ⇒ See more backgrounds from SLEEPING BEAUTY by clicking here or here. Categories: Language | Tags: 3 Latin, Disney, English language, German, Sleeping Beauty, Snow White, Spanish language, Winner: EN, Word Mystery | Permalink. Every Wednesday, I explore the linguistic origins of one word in different languages I speak. Tools are among my favorite things. I think this is because tools have a specific, defined, useful and practical purpose. Tools are either good, or they’re not. They work as advertised, or they don’t. Sure, you can get fancy tools, but just ’cause they’re expensive doesn’t mean they’ll work any better. You’ve gotta respect tools for being that straightforward. You’ve also gotta respect ’em ’cause they make you learn a new word for them in every language, the sly devils. EN → tool — a device or implement, esp. one held in the hand, used to carry out a particular function. ORIGIN Old English tōl, from a Germanic base meaning “prepare”. ES → herramienta — Instrumento, por lo común de hierro o acero, con que trabajan los artesanos. [Instrument, typically iron or steel, with which artisans/craftsmen work.] ORIGIN Latin ferramenta [iron trader]. FR → outil — Objet fabriqué, utilisé manuellement ou sur une machine pour réaliser une opération déterminée. [Fabricated object used manually or by a machine to perform a given task.] ORIGIN Latin ŭsitīlium [necessary objet, furniture, utensil] derived from ūti [make use of, be used]. As usual, Spanish disappoints, this time by coming from a fairly straightforward Latin word. French surprises with the information that the Romans classed all practical items used on a regular basis together. I like this idea, as well as its further root, since that also speaks to practicality (one of the tenets of my religion). But today’s winner is English because “tool” does not come from Latin and because when Germans prepare for stuff, they mean business, which is another of the foundational principles of my way of living. 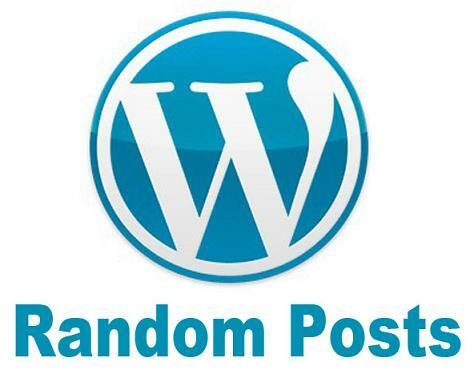 Categories: Language | Tags: 2 Latin, English language, etymology, French language, German, Latin, my life philosophy, Spanish language, Winner: EN, Word Mystery | Permalink. Well, that was surprising. Not long after an exchange with Suzanne about what things they’ll find odd when they move back to Canada, I found myself a bit confused in an American shower because I’d unknowingly adapted to those European hand shower nozzle spray things. It was weird to realize that I’d have to turn my actual body around if I wanted to rinse off instead of moving the nozzle around me. A little difference, but one that I never would have expected to get used to since I really hated those damn things for a long time. Then, like Archimedes before me, I exclaimed “Eureka!” when I realized that there was both a Euro Adapter moment and a Word Mystery just over my head like an idea bulb. EN → shower head — a perforated nozzle that distributes water over a focal point of use, generally overhead of the bather. ORIGIN of shower: Old English scūr [light fall of rain, hail]. 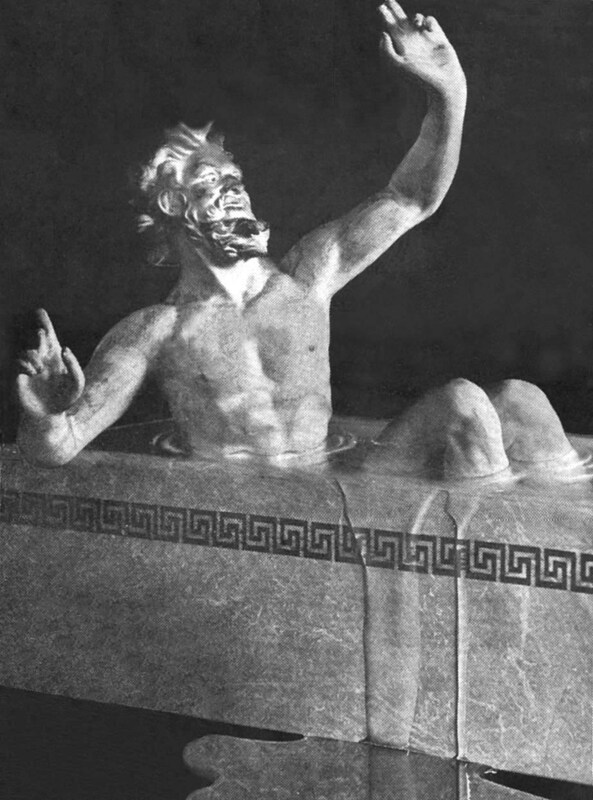 ES → alcachofa — Pieza agujereada por donde sale el agua de la regadera o de la ducha. [Holey piece from which water comes out in a watering can or the shower.] ORIGIN Hispanicized Arabic al-ḵaršūfa possibly from Pahlavi (Middle Iranian) *hār čōb [spiny stick]. FR → pomme de douche — Elément, généralement arrondi, percé de multiples trous. [Generally round piece pierced by multiple holes.] ORIGIN Latin poma [fruit (plural)]. Spanish Note: the definition given is the seventh of seven listed by the RAE. The first one is for the edible plant “artichoke” but once I learned that I showered under an artichoke every day, this definition became my favorite. If you look at one with this in mind, you can see how it resembles the cross section of a ‘choke. Today’s Winner: Tough again today. I came into the WM already favoring alcachofa, but I hadn’t known that pomme, a much-used word in French, meant “fruit”. Then I imagined Richard Burton saying scūr (his reading of Beowulf is the only time I’ve actually heard Old English spoken) and I really like the sound of that…so I don’t know. Spanish, I guess? Other opinions welcome. Categories: Language | Tags: 1 Latin, Arabic, Archimedes, Bathroom, English language, etymology, Euro Adapter, Fawlty Towers, French language, German, Latin, Monty Python, Old English, Persian, reflection of me, Shower, SNL, Spanish language, USA 2013, Winner: ES, Word Mystery | Permalink. Know where your “food” comes from. English is funny in that many dead animals that we eat are called different things when they’re on the chopping block. Cows are beef, calves are veal, sheep are mutton… the list goes on. This can all be traced to the Norman conquest of the land of Angles in 1066 and economic biases. You can learn more about why “The posh words are French and the rough words are Anglo-Saxon” in this nifty video but today we’re talking about the general term for dead mammal, one of my favorite things to eat, even when it’s a beloved pet. Sharpen your knowledge knives and dig in! 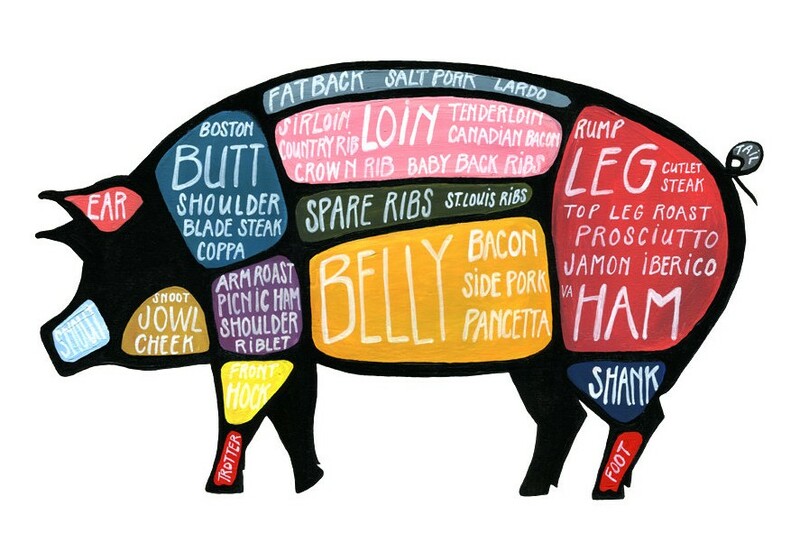 EN → meat — the flesh of an animal (esp. a mammal) as food. ORIGIN Old English mete [food] of Germanic origin. ES → carne — Parte muscular del cuerpo de los animales. [Muscular part of animal bodies.] ORIGIN Latin caro [flesh]. FR → viande — Aliment tiré des muscles des animaux, principalement des mammifères et des oiseaux. [Food pulled from the muscles of animals, principally mammals and birds.] ORIGIN Common Latin vianda from Low Latin vivanda [that which serves life]. Today’s Winner: Oh man, is this a tough one. How can I choose between a word that means “food” and one that means “gives life”? My first instinct is to go with English because, if I could get away with it, I would probably eat only meat all the time but I do love the irony of calling dead flesh “life-giving” so, vive la France! Categories: Language | Tags: 2 Latin, English language, etymology, French language, German, Latin, Meat, Spanish language, Winner: FR | Permalink. 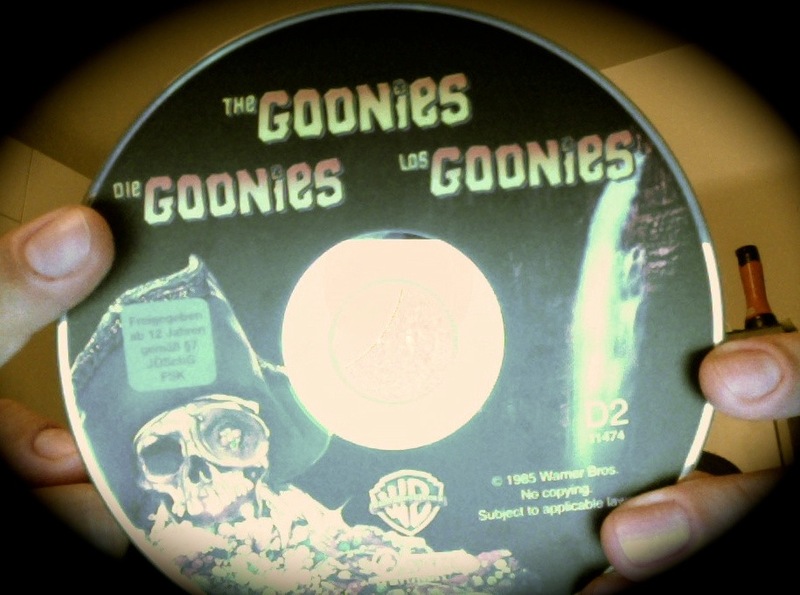 Thinking about how great THE GOONIES is motivated me to actually dig my copy out of a box. (That most of my stuff is still in boxes is super depressing and I don’t want to get into it.) Before I was even able to sit down and rewatch it, I started laughing. My copy is a Region 2 DVD that I got in Spain my first year as an expat, so the printing is in many languages, including German. Goonies never say die… except in German. German is hilarious in general, but the fact that their definite article “the” is “die” means that almost anytime I see something in German, I crack up. And amusing myself is the most important thing I do all day, so being able to speak German would mean endless chortling, snickering and guffawing. This movie was not as funny as it should have been. 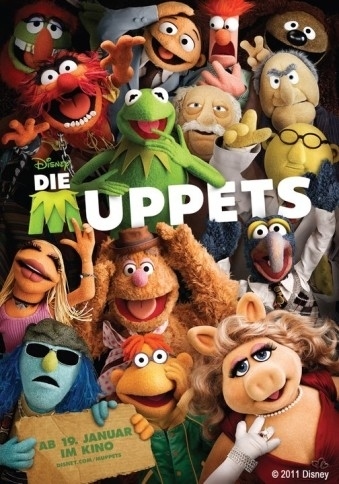 Categories: Language, movie | Tags: expat, Fliegender Zirkus, German, German language, The Goonies, The Muppets | Permalink.